For more than a century, the tale of Jekyll and Hyde has captivated the world imagination. In this chilling and diabolically clever reinvention, evil lives again. Dr. Henry Jekyll (Dougray Scott) is a well-regarded physician whose evenings are spent researching a rare and sacred Amazonian flower so potent it's said to literally separate the soul, giving life to man's Dark Self. The obsessive experiments to isolate its psychotropic properties happen to coincide with a series of brutal murders gripping the city with fear. Jekyll knows it's no coincidence. While his nights are lost to him, he awakens with bloody mementos and violent memories of the screams of his victims. He knows the Dark Self is coming into his own. It's even given himself a name: Mr. Edward Hyde. Anxious to plead guilty, waive trial, face sentence, and be put out of his misery, where he can no longer do harm, Jekyll solicits the help of Claire Wheaton (Krista Bridges), a compassionate attorney attracted to unusual and lost causes. Agreeing to represent Jekyll, her case for extreme mental imbalance is convincing. Confined to an asylum, Jekyll realizes that he has lost control, that Hyde now emerges in both body and soul on a horrifying whim, and slaughters with equal abandon. Hyde also knows that Claire is looking to suppress him. What Hyde doesn't like, he kills. And while Jekyll is safely locked away, Hyde isn't. Co-starring Emmy winner Tom Skerritt, Robert Louis Stevenson's Gothic classic is now ingeniously retold to terrify audiences anew. Yet another take on the Robert Louis Stevenson classic arrives via the 2008 ION Television version of Dr. Jekyll and Mr. Hyde. In this one, Dougray Scott plays the eponymous physician. The successful neurologist maintains a job at a hospital, but his extracurricular experiments make him AWOL much of the time. What does Jekyll do with his private time? He tampers with his genetic makeup, the results of which make him occasionally transform into Mr. Hyde, a homicidal maniac who also displays super-human strength and resistance to physical damage. Jekyll tries to deal with his Hyde side and even goes to a lawyer named Claire Wheaton (Krista Bridges) to tell her to get him incarcerated immediately. She doesn’t believe him at first, but she soon becomes convinced that Jekyll told her the truth, even though she still doesn’t buy his split personality claims. The film follows his attempts to get a handle on his situation along with Claire’s assistance. As the classy productions on HBO demonstrate, “made for cable movie” doesn’t have to be a negative. Those productions can look and feel like “real” films and not have the stink of cheap cable production values all over them. No one responsible for Hyde received that memo. Indeed, I don’t know if they were even aware they were making a movie, as Hyde looks and feels more like an episode of some network crime drama. It’s like CSI: Mr. Hyde. This is tacky TV movie territory from start to finish, and the results aren’t pretty. Obviously the story has a lot of staying power or else it wouldn’t have gotten umpty-ump film adaptations. The tale’s psychological undertones and fantasy elements make it a good candidate for continued exploration, as different takes on the legend can reveal new facets. None of those emerge from the simplistic version seen here. Actually, I can live with simplistic – I dig some Michael Bay flicks, after all – but I can’t deal with dull, and that’s what we get from this Hyde. The emphasis on the lawyer character becomes an odd viewpoint, and not an effective one. I guess she’s supposed to be our entry in the events, but she’s a boring personality and not one who maintains our attention. The Hyde scenes might work better if not presented in such a cheap crime drama way. All of the usual cinematic techniques like moody lighting and hand-held camerawork can’t overcome the director’s basic inability to tell a story and present an effective horror sequence. We get cheap creepshow tactics, all of which get bludgeoned by the flick’s omnipresent music. Oh, that score! Not only does the movie subject us to its music on a virtually nonstop basis, but also the score won’t ever let us think for ourselves. The loud electronic music beats us with every possible emotion and never allows us to take events for their visual worth. It’s an aggressive score that tries to create feeling in the audience but instead, it simply gives us a headache and makes an already lackluster flick downright cheesy. I do think Scott offers a decent performance as Jekyll/Hyde. He camps it up a little too much in the latter part, but he offers the film’s only minor pleasures. Unfortunately, everything else stinks so bad that even the greatest acting in the world couldn’t allow the flick to succeed. 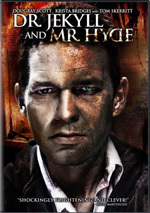 Dr. Jekyll and Mr. Hyde appears in an aspect ratio of approximately 1.78:1 on this single-sided, single-layered DVD; the image has been enhanced for 16X9 televisions. The transfer was tolerable but rarely good. Sharpness seemed decent. Much of the film demonstrated acceptable delineation, though some shots were a bit soft, and some appeared mildly blocky. Definition was okay but not particularly strong. No issues with jagged edges, moiré effects or edge haloes appeared, but video artifacts were heavy at times. These gave the program a rather messy look. Colors seemed similarly bland. The movie used a stylized palette that often favored chilly blues or sickly greens/yellows. The hues lacked much presence, as even the shots with natural tones tended to be somewhat flat. Blacks were inky, and shadows appeared a bit heavy and opaque. I thought the flick looked good enough for a “C-“ but it didn’t prove especially satisfying. As for the Dolby Digital 5.1 soundtrack of Hyde, it came with little ambition. The audio stayed primarily focused on the front, as not much more than reinforcement popped up in the surrounds. Music showed good stereo imaging and dominated the mix; the loud score filled the speakers more than anything else. Some effects fleshed out the track but not in a particularly involving manner; perhaps I just couldn’t hear them under that domineering score. Only a few scenes – like one in a jungle – used the back speakers in a moderately engaging way. Audio quality was decent. Speech tended to be somewhat thick and metallic, though the lines were always intelligible. Effects were fine, as they showed acceptable clarity and delineation. Music boasted pretty good range, with bright highs and strong bass. The soundtrack didn’t dazzle, but it was fairly good. An ad for Tin Man opens the DVD. Otherwise, the only extra is A Man of Many Faces: An Interview with Dougray Scott. In this 16-minute and seven-second piece, the actor tells us what attracted him to the project, research, the characters and aspects of his performance, aspects of the production, and some of his other projects. Wow – Scott put an awful lot of thought into his role. Hearing all the work he did for the part makes me feel bad I hated the movie so much. Anyway, at least this featurette offers an interesting look at the actor’s performance. It also comes as one uncut reel, so it’s kind of fun to see the stops and starts usually edited out of this kind of piece. Tacky and ham-fisted, Dr. Jekyll and Mr. Hyde provides a downright dull piece of nonsense. It takes a classic story and bludgeons it with cheap TV movie production values and one of the worst scores I’ve heard in a long while. The DVD presents drab picture, generally good audio and only one minor extra. From the awkward exposition to the predictable “twist” ending, Hyde flops.